Less than half a year before stadium opening there’s still no agreement between the city of Regensburg and SSV Jahn. Negotiations have been ongoing for months, but revenue share is still unclear. In the summer of 2014 the municipality and SSV Jahn assured to reach a final agreement by autumn. But we’re nearly in mid-March and still no contract has been signed by either party. The city and club cannot agree on how to split revenues from Continental Arena. It’s high time to find a compromise, because the stadium needs to be urgently commercialized if any party is to benefit from the very beginning of its operation. So far it’s unclear how many business seats or skyboxes were sold, just like who would take the money. 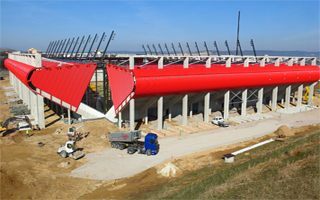 What is clear is that all of the sale would be carried out centrally by Continental Arena’s public operator Regiebetrieb Arena Regensburg. Regensburg city council is to receive a final contract between the municipality and SSV Jahn by the end of March. According to the initial letter of intent on revenue share, the city should benefit entirely from naming rights (secured by Continental for €1 million over 5 years) and skybox sales. Meanwhile the club should have all of the business seats and banner advertising. But the club assure the better the deal is for them, the better it is for everyone. “If the club is doing well, ultimately the city will also be doing well”, says Johannes Baumeister, Chief Financial Officer at Jahn. It seems legitimate that the club should be stable financially to aspire to the 2. Bundesliga and attract new sponsors and fans. However, in recent years it hasn’t been the case for Jahn. The club reached the desired second league in 2012 (all-time best to date), but were relegated after just one season. Currently a similar scenario is likely to happen in the 3. Liga, as Jahn are the very last team. It might happen that the opening of Continental will be a rather sad moment of return to regional football after a few years on national level.